This Men's Chef Pant in a Citrus print is comfort, quality and value, all bundled in one. No matter what industry you're in or the need for this chef apparel, this pant is well-made and gives you the best value at a competitively lower price. Made of medium weight 100% cotton twill, this pant is sure to give you breathable comfort even during long workdays. This chef pant has a 1.75" elastic waistband with inside draw cord allowing ease and flexibility needed to take charge in any kitchen and 2 deep front pockets/2 back pockets for functionality and storage. All features are designed to create a look that doesn't get any more professional than this chef pant. To help complete the look of this chef wear or uniform, this pant easily coordinates with any attire or matches any standardized uniform requirement. The approximate inseam for size Large (L) is 32". Please refer to the additional product images that contain our size chart and measuring instructions to help determine your best fit. BAGGY FIT: This chef pant is men styled and fitted for durability and comfort ensuring this pant works as hard as you do without the hassle. This pant features a 1.75" elastic waistband with inside draw cord, zippered fly, 2 deep front pockets and 2 back pockets, and a tapered leg creating a look that doesn't get any more professional than these chef pants. EXCLUSIVE PRINT: Tired of wearing traditional restaurant pants to work? Try something that looks more like your favorite non-work pant. 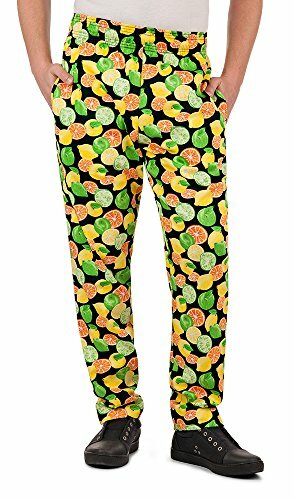 This pant comes in an exclusive Citrus print design by ChefUniforms.com and will please even the pickiest pro in the kitchen. GREAT QUALITY: This pant is made medium weight 100% cotton twill that feels great and looks good. These are made with food service professionals in mind. EASY TO CLEAN: Machine wash these chef pants with similar colors and tumble dry on low. If needed, cool or hot steam iron. EXCELLENT VALUE: This Men's Chef Pant is comfort, quality and value, all bundled in one. Bakers, Chefs, Line Cooks, Caterers, Counter Servers, Expediters, Directors, Managers, Students, etc. ; all find this coat affordably priced and available in a wide range of sizes perfect for all food industry professionals. Great for theme and costume parties especially for Halloween. Click 'Add to Cart' now to join the list of satisfied buyers!